As much as I watch movies of all types, and enjoy a great deal of them, every so often one comes my way and unexpectedly knocks my socks off. This is one of those kind of moments, and this is one of those kinds of films. Joe is a very unhappy working class man who works a mundane job in a big facility, meandering through life in a fog of fluorescent lighting. He's a small fish in a big pond, a disposable element in a giant machine. He's a hypochondriac who feels that there's surely something physically wrong with him. When a checkup at a doctors office reveals he's got a "brain cloud", and only has a few months left to live, he takes a billionaire's offer to commit suicide by throwing himself into an active volcano on a tiny island inhabited by a small group of natives, believing that the sacrifice will not only serve a purpose in his meaningless life, but will also appease the gods of the island and prevent it from erupting. 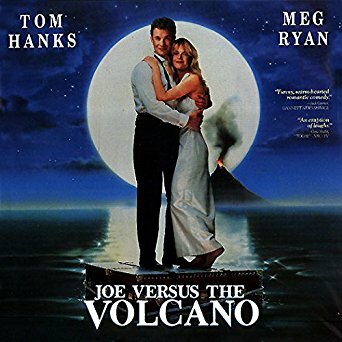 Joe Versus The Volcano quite simply floored me. It's nothing like what I expected, but in the best possible sense. Much like my recent experience with John Landis' Into the Night, Joe Versus The Volcano is almost undefinable. It's a fascinating and unusually competent mix of magical, mystery, dystopian society, romance, adventure, comedy and drama. Just when you think you know where this is headed or have it "figured out", it veers off into another completely direction that takes you by surprise. On the surface, I'm not surprised this one flew so far under my radar that I never made any real effort to actually watch it. I remember this one. I remember the trailers and posters making it look like any other lame cookie-cutter romantic comedy, when in reality it's anything but. Having finally seen it now though, I guess I can understand the difficulty in marketing a film that starred comedy powerhouses Tom Hanks and Meg Ryan - Hanks coming off a string of hit comedies, and Ryan having struck gold with When Harry Met Sally just the year before. So I can only assume audiences were somewhat taken aback by a film that is nothing like a romantic comedy, or even just a comedy in general, but rather a magical film that would be near impossible to tie down to any specific genre. It's also unlike any film I'd ever seen, which makes it all the more special. Written and directed by John Patrick Shanley, who had previously won an Oscar for his Moonstruck screenplay in 1987, here makes a remarkable directorial debut. You would never know that he'd never directed a film before. 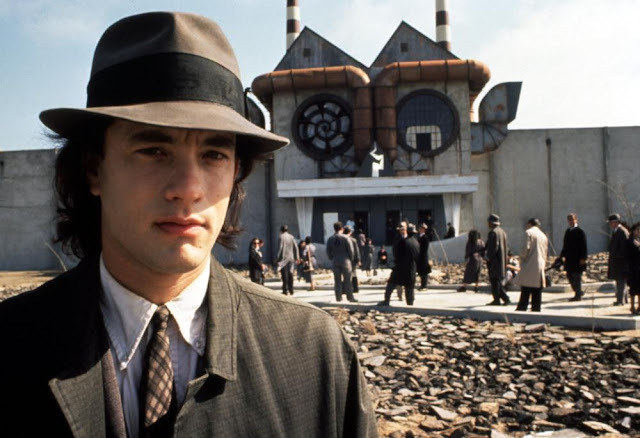 There was so much visual brilliance, so much in the way of early Tim Burton, Barry Sonnenfeld and even early Alex Proyas, yet a bit more subdued but not any less significant or meaningful. It packs a visceral punch the way very few films can. You can tell just by watching this that this man clearly had a vision in his head, and every frame is damn near a work of art. There's just something very special about the way he frames his shots. It's the kind of artistry you rarely ever see anymore, and one you would not expect to see in film like this. So many of this films stunning imagery has been permanently burned and seared into my brain. It's shocking to me to discover that Shanley only ever directed 2 films in his entire career - this one in 1990 and the 2008 drama Doubt. It's such a shame that someone with so much visual talent never continued directing films on a regular basis. He's a very special kind of talent, and if this film is any indication, he could have really given cinema some qualified gems over the years. This film is an underrated gem and misunderstood classic, there's no doubt about that. Even though it's a totally and unique original work, I feel a lot of the blame for it's box office failure should fall on the marketing department, whoever that may be. The light-hearted funny sappy little romantic comedy that was thrown at us in posters, ads and commercials does not accurately portray the final product, and while there are little bits and pieces of those things in there, as a whole it's something completely different. And it's because of this mis-marketed snafu, lovers of original cinema really missed out on something rare, and dare I say brave? Even today, with all the various releases of this film on different platforms and re-issue's, they still don't have it right. 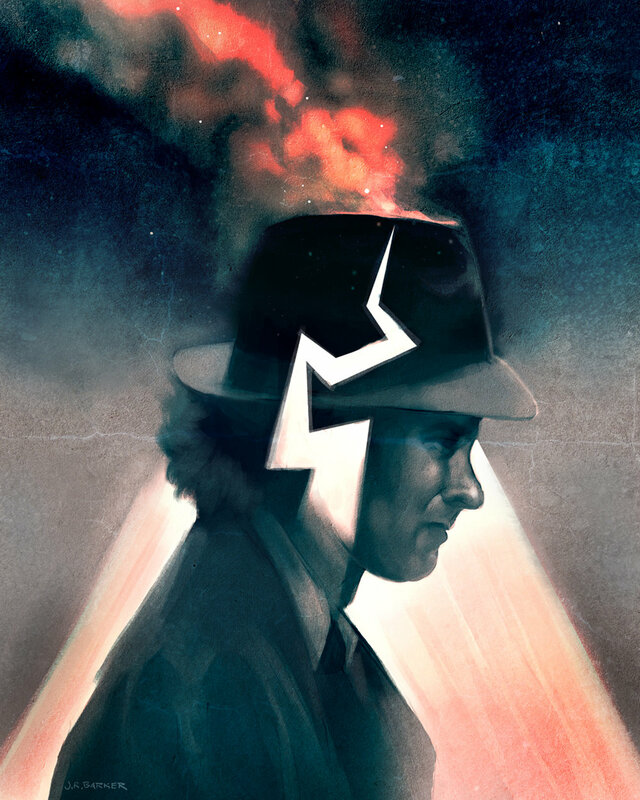 This image on the left, by artist J.R. Barker, is a much better representation of the film than any of the studio released poster art over the years. It captures several different themes from the film, and represents so much of it in general in this one image. Too bad a studio will never understand how much more effective this would be. 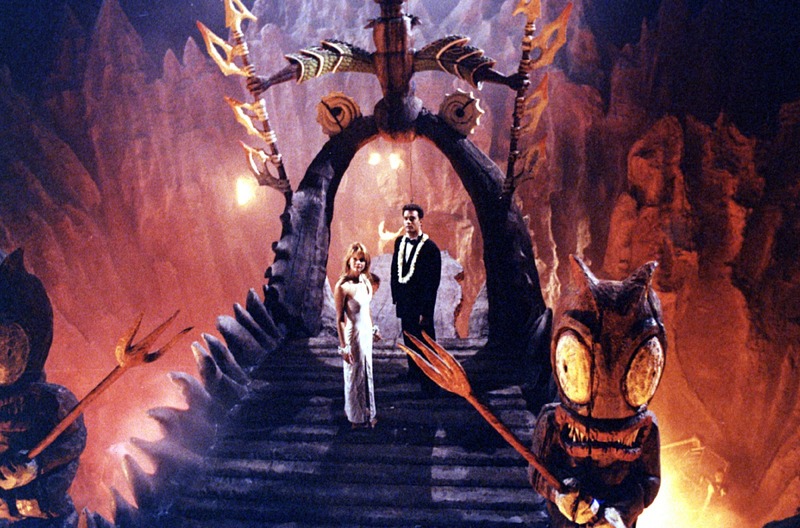 I should also point out that a lot of what makes the film's look and visual aesthetic so appealing is that the production design was under the vision of Bo Welch, who would design the productions of many classic visually amazing films like The Lost Boys, Beetlejuice, Batman Returns and Edward Scissorhands to name a few. You can see a lot of his gothic/industrial influences in the majority of the entire first act. Helping to bring this all together in such an aesthetically pleasing way is cinematographer Stephen Goldblatt, who did some outstanding work on a personal favorite of mine, Outland, as well as Tony Scott's The Hunger and Lethal Weapon 1 and 2. This triple threat of talent (Shanley, Welch & Goldblatt) is really one of this films greatest assets, because if you were to take away the film's compelling structure, story and performances, you'd still have one of the most visually stunning films ever made in this niche genre. No, correction. In "any" genre. Joe Versus The Volcano is a film that's begging to be discovered. It's been a long 27 years since it was released, a quarter century, and people still don't know about it. Or they have heard of it, but mistook it for the film it was marketed as, which it ultimately is not, and ignored it. Whether you stream it, or watch it on DVD or Blu Ray, whichever you choose, just make sure that it's in widescreen. It's a film that utilizes this format to breathtaking results and only makes the experience that more stimulating.